Disclosure: I received review items from Oriental Trading. All opinions are my own. 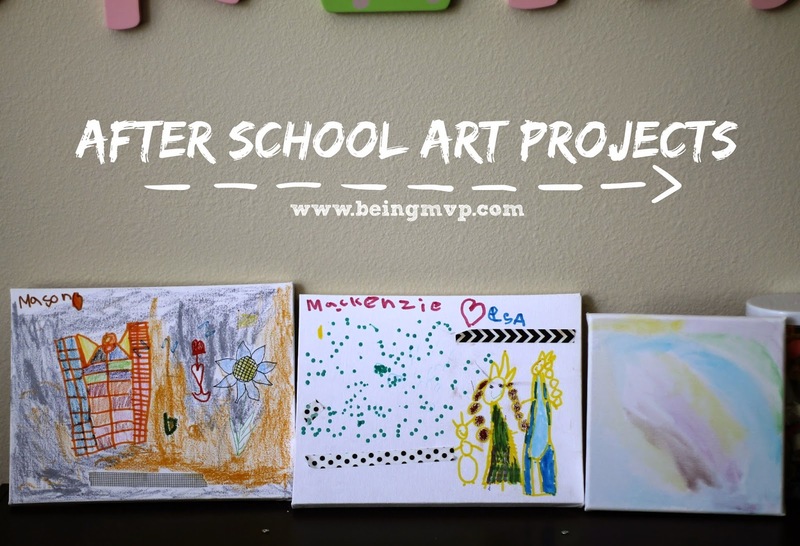 Kenzie is enrolled in extracurricular art classes at school (thanks to grandparents) and she is always excited about bringing home her projects and displaying them at home. Since their school seems to order from Oriental Trading exclusively for all supplies, it's natural that I feature them during this event. Oriental Trading has everything you would need for back to school and more. After school, while waiting for dinnertime, Kenzie enjoys drawing and painting. 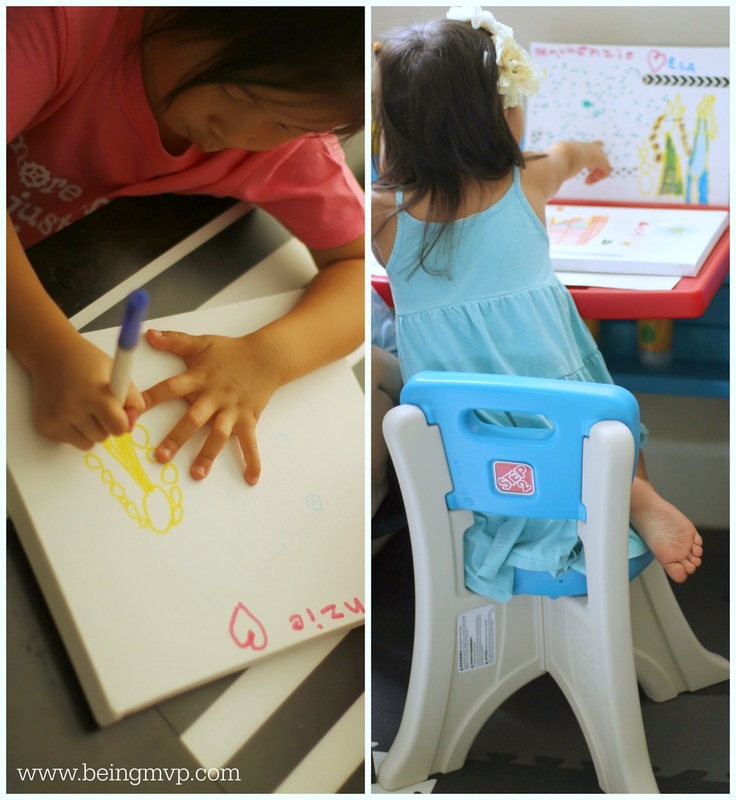 Oriental Trading's DIY canvases is the perfect palette for Kenzie's creativity. I gave Kenzie free reign to go at it with paint and stickers. The Washi Tape is so easy for kids to work with and it adds a fun textile element to their art. It's interesting to watch a child think and create something that can be treasured and displayed in the home. These canvases are stretched burlap over unfinished wood. After the masterpiece is complete, just let dry and then hang on the wall with a simple nail or display on a shelf! After washing paint brushes, I usually just leave them near the sink to dry. With the Wave Paintbrush holder, I can stand the wet paintbrushes upright to dry as well as organize the rest of Kenzie's markers, pens, pencils, crayons and more. 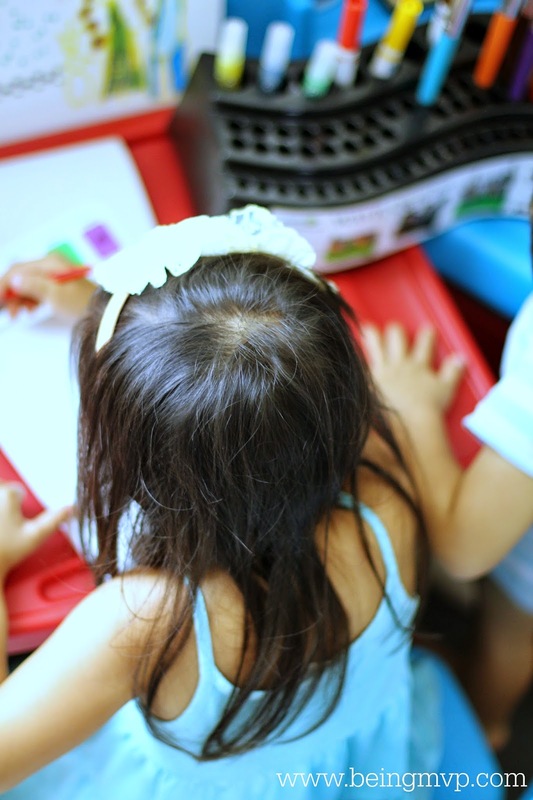 There are many, many openings to place your child's art tools which is nice rather than having them clutter your entire house. Check out all of the Oriental Trading selections for Back to School and take advantage of the fantastic prices! One winner will Receive a Variety of Oriental Trading Art Supplies! These Rainbow Design Crayons look like fun! My boys would like the Awesome Alphabet Bean Bags. My daughter would like the rainbow crayons. My daughter would love the plush monsters or plush owls. My nephew would love the rainbow design crayons. Hope I win this giveaway so that I may give them to him! My niece would love the wonderful wood markers. My niece would love the chalkboard sets to practice her spelling words! My kids would love the Jungle Reading Corner! I never realized that Oriental Trading has school supplies in individual packs. Wow! My kids would love the Wonderful Wood Markers. Oh my, there are so many things to pick from! I know my kids love markers! I love their stickers, party favors and party decor in general. Love the wood markers and rainbow crayons. At our house the Glue, Tape & Adhesives. We would love a variety of their paint pens. My granddaughter would love the Neon Net Backpacks. The colors are so pretty. My son would love the Crayola Inspiration Art Case, he loves to draw and color. My kids would love the Mega Deluxe Toy Assortment because it is full of all sorts of stuff to do. I would let them pick one thing to do after school and after homework each day and that would make all of our days easier and much more fun. The bulk pencils are a great idea! my kids would love the cool different markers. My daughter would love to have the Lalaloopsy Pencils! My daughter would love the DIY music guitars. I know this isn't school related but she would love it. I made the mistake of letting my kids browse the link LOL - they unanimously agreed they "NEEEED" the rainbow scooter set. My grandson would love the Color Your Own Halloween Friend “Trick-Or-Treat” Tote Bags. I think we'd have a lot of fun with the fabric paint pens and you can never have enough Tempera paint! I love the Great Job trophies they have, I think those would be good for boosting morale and grades in our school ( homeschool). My son would like some pencils, pencil sharpener, erasers and glue! I'd like the Crayola® Colored Pencils - 50 Count. I love the quality of Crayola products. I like the Chair Shelf Classroom Organizers. Stickers (he is 4) or the math magnets look cool. Oriental Trading is awesome. My children would love all of the different pencils you can get. First, that picture on the landing page made me jump. Their Halloween decorations are quite creative. Lucy loves "bling" so the jeweled adhesives would be one of her favorites. My daughter would love the beading supplies. My son would like the Crayola® Colored Pencils - 50 Count. Halloween decorations would be fun! My girls would love the lalaloopsy pencils! She would like the 60 Neon Dry Erase Markers. My son would love the “Consonants Carnival” Final Letter Game. My son would like the Sanford Mr. Sketch Scented Marker Sets.